This 4 light vanity highlights crystal accented shade to match glam dicor. . The fixture is finished in polished chrome which matches most home styles. Bulbs are included ready to install. Bring a subtle grace to your washroom with Hampton Bay's Rounded Three Light Vanity in Chrome Finish. This simple, up-to-date wall light creates brilliant, focused illumination to your bathroom or bedroom mirror while complementing both traditional and modern decorating schemes. Add radiance to your hallways with Hampton Bays Wave Four Light Wall Sconce. Featuring sleek lines complemented by satin nickel finish, this fixture will add a modern touch to any dicor. With an elegant, curvaceous frosted glass shades, this vanity light will immerse your bedroom, bathroom or hallways in a warm glow. 4-Light Chrome and Crystal Vanity Light Fixture This 4 light vanity highlights crystal accented shade to match glam dicor. . The fixture is finished in polished chrome which matches most home styles. Bulbs are included ready to install. 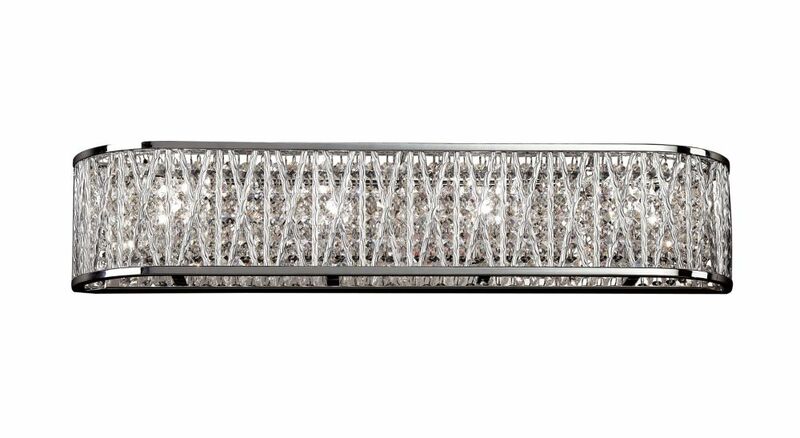 4-Light Chrome and Crystal Vanity Light Fixture is rated 5.0 out of 5 by 1. Rated 5 out of 5 by Dennis Rose from Easy and classy install. Arrived in time promised and intact. Installed quite easily. Looks like a million bucks. Downside? It's so classy I might have to renovate the rest of the bathroom now! Is it possible to use LED bulbs in this fixture? Yes, you can replace this bulb with a Edison base led bulb. We can't find any instructions for assembling the crystal strands i.e. what order they go in. We also can't find an instructional manual online. Is there anything available? Hi Eric, please email us at QA@BelAir-Lighting.com and we'll forward you the PDF version of the instructions.